The Mobis II Seat is part of the next generation of lean-to (or -into) stools. Based on the original Mobis Seat it features a thicker seat cushion than the Mobis I, making it more suitable for users who intend to "sit" rather than "lean" throughout the day. Its unique design permits 6º of pivoting movement in all directions through a secure pivot point at the base. Rather than simply reducing the workload on the legs by taking the weight of the upper body (which traditional lean-to stools accomplish), this pivoting capability allows the Mobis to move with users as they perform tasks. 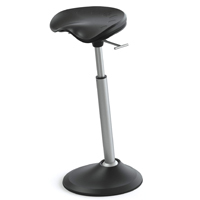 This light-weight, elegant, grab-and-go version of the Locus Seat supports the body in a relaxed, upright posture. The Mobis II Seat has a range suitable for people from 4'11" to 6'8" tall. 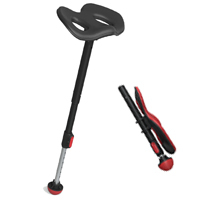 Dual lift controls let it be easily adjusted for work surfaces of varying heights. The small footprint of the Mobis II also makes it ideal for anyone creating a workstation that includes sitting or standing. By providing an in-between seating option for short-term tasks, the transition to a standing position becomes almost effortless. 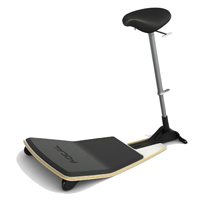 The Mobis II offers enough support to keep fatigue at bay, while still allowing the user to rotate a full 360º, to turn from side to side, and to flex forward, backward and laterally. 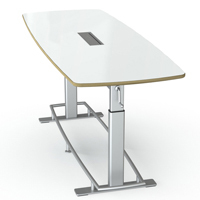 The Mobis II is ideal for raised conference room table applications. Offering many real ergonomic benefits and improved comfort, the Mobis II is also a uniquely styled seating option that will make a positive statement about the workplace, as well as the occupant of the workstation. The Mobis II Seats feature a Black base with Silver gas lift. The Locus Sphere Desk is an elegant height and angle adjustable standing desk which provides functionality in a stylish form. 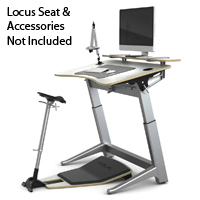 It is ideally suited as the worksurface for the Locus Seat from Focal Upright Furniture. The worksurface height can be precisely adjusted using a German-manufactured design which allows the unit to effortlessly glide from 36" to 48" above the floor. The gears are 'one-to-two' to reduce the number of rotations required for movement, and are self locking so the worksurface will not slip once set. The angle of the worksurface can be adjusted from level to 15°and there are leveling feet on the base. The desk is constructed of a powder-coated extruded and cast aluminum base which conveys a professional clean and stylish look (thanks to the slope on the feet). The worksurface is 78" W x 31" D x 0.75" H and features an organic 'arc' design which is ideally suited to demarcate the comfort zone of most individuals. It is composed of hardwood plywood with three layers of polyurethane varnish on the veneers (Black Walnut or White Oak) or a melamine laminate (Matte Black or Glacier White). A strongly recommended accessory is the Sphere Stay Flat Shelf (48" W x 10" D x 0.75" H) which is a secondary raised surface which is always level regardless of adjustments to the primary worksurface and is ideal for ensuring a monitor is at an ergonomically correct height. Other accessories include a Cable Management System and an IMAC Monitor Bracket. 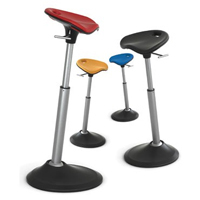 As mentioned earlier, this product is perfectly complemented by the Locus Seat. The Foot Bar from Focal Upright offers those who work at standing workstations the opportunity to adopt varying postures throughout their workday. Now, rather than standing with both feet planted, the user can raise one foot and rest it on the bar. This simple movement eases pressure on the sole of the foot, and encourages blood to circulate more easily through the tissues of the lower leg. The Foot Bar can also provide relief for the lower back. With prolonged standing, the natural curvature of the back often becomes gradually more extreme as the muscles tire. This poor posture can result in fatigue at work, and backache at the end of the day. Raising and supporting one foot reduces this extreme curvature, allowing the back to return to its stronger, more gently curved S-shape. The partially supported stance helps to alleviate muscle fatigue and reduce the risk of back pain. The low 3.5" height of the bar lets the user easily switch from one foot to the other. The Foot Bar provides over 20" of rail width supported on both ends by sturdy non-marking rubber supports. Effective grippers keep the bar in place on both hard and soft surfaces. Raised ridges running the width of the bar can provide a comfortable massaging effect for users who opt to work without footwear. Confluence Conference Tables from Focal Upright Furniture carry the trend towards active working from the office to the conference room. Designed to be used while standing, or while leaning on a sit-stand stool (such as the Mobis or Mogo Seats), these adjustable-height tables help users to remain active and engaged for the duration of a meeting, resulting in more productive and effective collaborations. The Confluence Conference Tables feature a sturdy, eco-friendly manually operated base with dual hand-cranks, making them easy to adjust from either end. The tables can be adjusted for optimum height anywhere between 36" and 48". A heavy stainless steel base and footrail provide stability for the table as well as a convenient footrest for standing users. 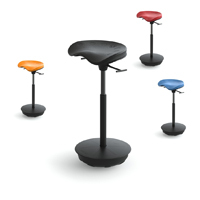 The footrail also offers a natural bracing point for users of the Focal Upright Mobis Seat or Mogo Stool and other types of leaning seats. The Confluence table top is available in several finishes. Neutral Matte Black and Glacier White laminate finishes are available for the classic office environment; White Oak and Black Walnut wood veneer are available for those who wish to make a statement. The innovative and practical Dry Erase White Board table top provides an interactive surface for creative group brainstorming. All models feature a convenient cable hatch in the centre that permits cables, power cords, and markers to be stored neatly away, without restricting easy access to these items. 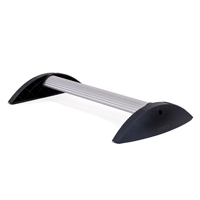 The Focal Koncept Equo Desk Lamp is designed to provide soft, even illumination which can be effortlessly directed to a specific location on Locus Desk worksurfaces. The Warm White (3,500 K) illumination is easy on the eyes, deliberately avoiding the higher Kelvin "blue" range associated with sleep issues, which many people also find tiring to their eyes. A counterbalanced arm offers fingertip adjustment to a maximum elevation of 24" and extension up to 24" from the mounting point. The Equo has the unique ability to maintain the selected angle of illumination even as heights are changed. The luminaire head is also able to rotate a full 180 degrees, offering users the ability to fine-tune the direction of illumination. This head can be easily detached should replacement be necessary. The direction and spread of illumination are easily adjusted so that glare is significantly reduced or eliminated, further reducing the strain on the eyes. A convenient touch strip provides fingertip dimming control for setting just the right amount of illumination.The ability to maintain a consistent angle as elevation is adjusted further assists in the avoidance of glare. 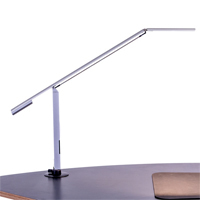 The Focal Koncept Equo Desk Lamp is equipped with a custom grommet mount. 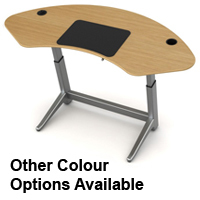 This conveniently replaces one of the grommet-mounted cup holders on the Locus Standing and Locus Sphere desks.